Dog boots are shoes specially made for dogs. 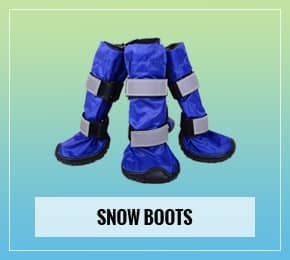 What's the difference between dog boots and dog booties? Nothing, really! They are just different ways to describe paw-wear for your pooch. 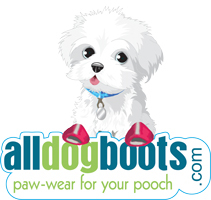 Alldogboots.com is the iconic spot to find dog boots because that is all we do! We care about your dog's paw health. Our dog booties keep your dog safe during any weather condition or for any canine medical need. What are the best dog boots? The best dog boots are made to protect your dog’s paws. 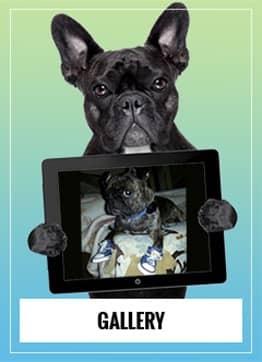 There are many great reasons for your dog to get a set of dog boots so which is best depends on your dog's needs. Have you ever taken your dog for a walk in the winter through the snow and wondered if his feet are cold? If you live in a part of the country that has considerable snowfall, these conditions can be hard on your dog's paws. If they walk in snow enough, a dog’s paws can get splits in the webbing between their toes from the icy conditions. And let's not forget to mention those high vet bills because of the toxic chemicals put down to melt the snow! A good set of dog booties can protect from all the harsh winter elements. Rubber soles will give him good traction, too. A set of dog boots like this can be water resistant and great for keeping those feet dry and warm. We recommend the Hi-Toppers winter boots. You can find them here. Waterproof boots for rainy weather can be a lifesaver. Okay, this may be more for you than the dog. There are those dogs that are perfectly willing to go romp in the yard, rain or shine. Getting wet? Big deal! Well, it is a big deal when they come barging in from the yard with wet, muddy paws. If he is wearing his dog shoes, you can take them off and leave them on the porch next to yours and you can avoid mopping the floor or a call to the carpet cleaning folks. We recommend the Soft Sole booties for wet weather. You can find them here. What about in the summer, when it’s 100 degrees and the asphalt is so hot you can fry an egg on it? If you don’t like to walk across the pavement in your bare feet, your dog probably doesn't want to either. 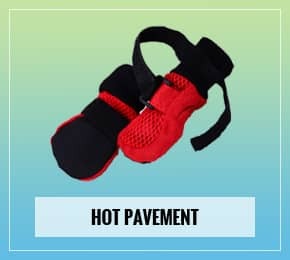 A lightweight, breathable set of boots can save your dog from the pain of the hot asphalt and protect his paw pads from burning. We recommend the Meshies booties for heat protection. You can find them here. People who hike often like to take their tail wagging companion with them into the mountains. You can even get hiking boots for your dog for better traction, especially coming down steep inclines. Sidewalks, hike-and-bike-trails, and roadways can even have sharp burrs or thorns or even broken glass that can get stuck in the pads. If you take your dog along on your bike ride, you’re liable to come across anything along the way that can hurt your dog’s paws. For hiking, we recommend the Ultra Paws Durable dog boots. You can find them here. A comfy pair of dog booties with a little bit of tread can be ideal for around the house if your dog has trouble negotiating slippery floors due to aging or injury. They will also keep those claws from making annoying scratches on your expensive flooring. 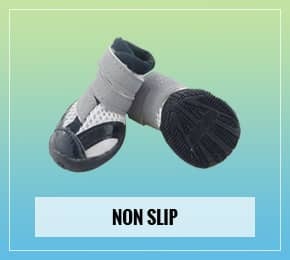 We recommend the Sporthos summer boots for indoor traction. You can find them here. And who doesn’t know someone who likes to dress their dogs in the latest attire? What well appointed pooch doesn’t have dog booties for every occasion? How about some trendy dog sneakers that match your own? And what canine diva wouldn’t love some stylish doggy slippers for around the house and some fashionable leather boots? We recommend the Zoomies booties for a trendy look. You can find them here.